Malish Introduces the Sonic Scrub Mal-Grit Scrub at ISSA/INTERCLEAN CHICAGO 2016. 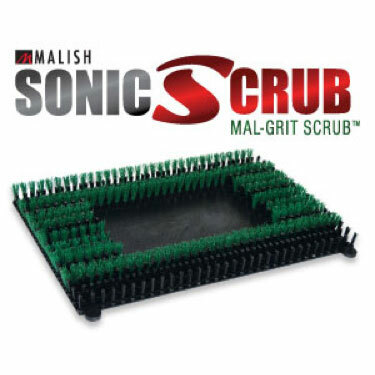 October 2016 – The Malish Corporation has had a very successful year after introducing the Sonic Scrub at last year’s ISSA North America show and we wanted to take it one step further. At this year’s ISSA/INTERCLEAN 2016 Chicago, Malish is showcasing the Sonic Scrub Mal-Grit Scrub™ – the latest addition of the revolutionary Sonic Scrub product line – NOW WITH GRIT! Attendees will get a hands-on look at the industry-leading Sonic Scrub Mal-Grit Scrub™, a 14” x 20” brush featuring nylon grit filament designed for heavy-duty wet scrubbing or light stripping on VCT, quarry, grouted tile and Terrazzo flooring. Use the Sonic Scrub Mal-Grit Scrub™ to remove the toughest dirt and scuff marks from heavily soiled floors. The Sonic Scrub brushes are designed specifically for the oscillating floor machine industry. This innovative, patent pending design from Malish offers the option for the user to replace their green floor pads. We all know that brushes outlast floor pads and Sonic Scrub outlasts them at least 20 to 1. Start saving time and money! Pitch the Pad … Buy the Brush! Along with the Sonic Scrub Mal-Grit Scrub™, Malish will also be showcasing their new line extension of their foodservice and janitorial brushes. Malish broadened their selection of HACCP-compliant color-coded brushes, added a line of mops and buckets, and enhanced their already extensive line of janitorial products. The end result is Malish’s largest offering ever! The Malish Corporation specializes in the manufacturing of cylinder/rotary/disc brushes and accessories, foodservice and janitorial maintenance brushes, and the Diamabrush™ by Malish Floor Preparation System. Stop by Booth #2145 to get a first look at Malish’s latest innovations. Visit Malish at booth #2145 or contact us at testing.malish.com for more information.